Whilst cooking jam with the delicious kumquats from our garden, I made an interesting find: Two equal sized batches of jam looked completely different in colour, and the only difference was that different pots were used. The way it worked is that one pot had a large surface area, so more water could evaporate, and the other pot had a much smaller surface area. 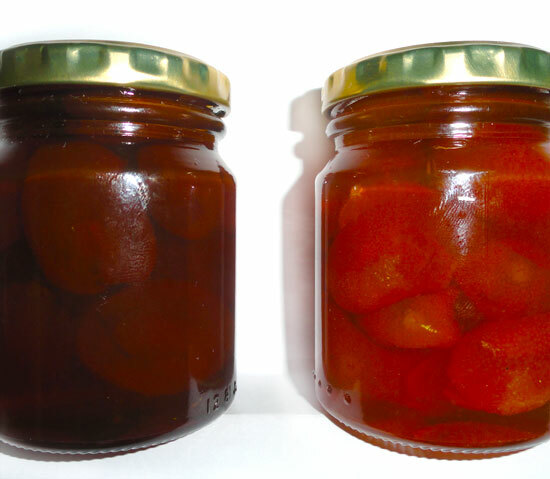 This meant that: the pot with a larger surface area reached the correct consistency much sooner, which meant a lighter colour jam (on right), while the pot with a smaller surface area cooked for much longer, so the jam was darker. Both, of course, are equally delicious, and you’ll find these fruits of our garden (and semi-scientific experiments) in the Babylonstoren shop. This is a really interesting journey, as we attempt to find the best ways to preserve our garden’s produce. Please share your own preserving experiences and helpful tips with us.